Reached only by an unpaved road then a 1.5 mile hike, Fort Bowie National Historic Site is the most isolated NPS unit in Arizona and is seen by the fewest people; visitation ranges from over 100 on a balmy spring weekend to zero on a stormy day in midwinter. 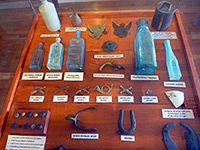 The site preserves the remains of a fort in operation from 1868 to 1894, a key outpost during the territorial dispute with the local Apache Indians, which after a long struggle inevitably resulted in the surrender of the local chief (Geronimo) and exile for the remaining members of the tribe, in Florida. 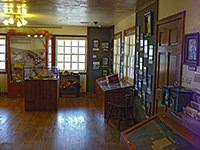 The fort was built near a spring and above a strategically important route between the Chiricahua and Dos Cabezas mountains now known as Apache Pass, through which the approach road runs today, linking Bowie on Interstate 10 with Highway 186 to Chiricahua National Monument, 10 miles south. The scenery around the pass and fort is rugged if unspectacular, but the remoteness and lack of any nearby settlements help retain a sense of what frontier life must have been like for the soldiers stationed here. 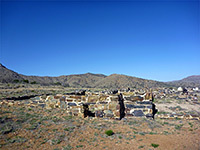 The trail into the NHS passes several other historic relics including a cemetery and stagecoach station, before arriving at the fort where about 40 ruined buildings may be inspected, mostly just low wall remnants since there have been no major reconstructions such as at other similar places like Fort Davis in Texas, but photographs in front of each site show how the structure used to look. Fort Bowie is however not quite as remote as it may seem from the long approach since the site is also accessible by an NPS service road and has both a staffed visitor center/museum, and a permanent ranger residence. 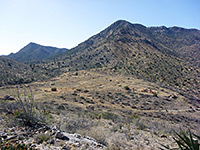 The 19 mile Apache Pass Road is used to reach the national historic site. The eastern approach is paved, across the edge of San Simon Valley, becomes unpaved as it starts to climb into the mountains then arrives at the trailhead a mile further, en route passing the junction with the NPS access road which disabled visitors or those otherwise unable to walk may use, with prior permission. All of the west part of Apache Pass Road is unpaved, crossing private ranchland, and has a surface of hard pressed soil which is impassable when wet but nice and smooth if dry. There is no campground in the NHS though a few places along the road are suitable for overnight stays, on public land just outside the boundary. The trailhead has no facilities apart from a restroom and a small information board. The 1.5 mile (2.4 km) trail to Fort Bowie is relatively easy, gaining just 350 feet in height, mostly towards the end. Distance markers record progress every quarter of a mile. South of the parking area along Apache Pass Road, the land rises gradually to undulating, grassy hills with bushy patches and a few rocky outcrops, but no visible signs of development. The path first crosses a wash, past the stone foundations of a 1860s mining cabin, enters a clump of trees around a smaller drainage then emerges into a wide valley. The next site is the ruins of the Butterfield Overland Mail Station; the actual stage route runs by to the south, still recognisably a track. 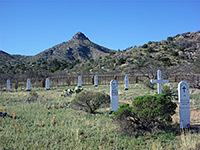 Fort Bowie Cemetery is just beyond, enclosed in a picket fence which replaced the original adobe wall, the foundations of which are still visible. Contained within are about 25 graves, marked by replica headstones; the inscriptions are authentic but not much else. A booklet gives brief life histories of each person interred. 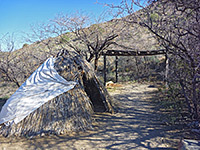 The path now turns east, over another dry wash then runs alongside the streamway, passing a small, partly reconstructed adobe building and a modern, replica Apache dwelling. The last section follows a short, wooded ravine leading to Apache Spring, still producing a reliable, year-round supply of water. The flow is now regulated, concrete walls enclose the actual source, and a notice warns against visitors drinking from the stream. The trees fade away just above the spring as the trail climbs slightly to the fort, where the main complex lies straight ahead, spread over 15 acres, while a 1/8 mile trail on the right climbs a little further to a low hill, location of the original Fort Apache - a temporary installation that was in use for just a few years. An alternative path, intended for hiking only on the return journey, leaves from the north side of the fort and climbs a limestone hill (Overlook Ridge) to a summit that has good views of the fort and the valleys below. Rocky ledges harbor a varied selection of desert plants including ocotillo, cane cholla, pink flower hedgehog cactus, Arizona barrel cactus, soaptree yucca, banana yucca and Palmer's agave. On the far side of the ridge the path descends slowly via some too-gentle switchbacks, crosses a valley (Siphon Canyon) and rejoins the entrance path just north of Butterfield Mail Station, half a mile from the trailhead on Apache Pass Road. In general the vegetation in this area is a mix of plants from the Sonoran Desert to the west and the Chihuahuan Desert to the east, as well as being influenced by Mexico to the south. Although the Apache wars ended in 1876, military occupation of Fort Bowie continued to 1894 and the place was not completely abandoned until around 1910. Residents of nearby towns removed much of the timber and a few lived for a time in some of the buildings, though the majority of the structures quickly decayed in the hostile environment - cold and snowy in winter, very hot (100°F or more) in summer, so that not much remained when the NPS took control of the site in the 1960s. The limited reconstruction included applying adobe to some of the remaining brickwork, creating the rounded, yellowish-white wall fragments seen today, which feature in most of the photographs of this location. The largest area of adobe is along the walls of the cavalry barracks, on the east side of the fort. Buildings to the south are the officers quarters and the hospital, while to the west are various service structures including the general store, adjutant's office, kitchen, school, telegraph office and storeroom. The parade ground in the center still has a (replica) flagpole carrying the Stars and Stripes, raised each morning by the resident ranger. Buildings on the north side are a granary, bakery, guardhouse, more barracks and storehouses beyond which lay the corrals and stables, and here stands today's visitor center, museum & bookstore. In total there are about 40 building foundations to inspect, most just a foot or two high, and all can be toured in around 40 minutes.